Holidays aren’t always easy or perfect when you have a blended family, but with some preparation and not getting hung up on the actual day, they can go smoothly and be fun! Even if you can’t be together as a family on a holiday, you can make your own traditions and celebrate on a different day…it’s just as special! Easter was both chaotic and quiet for Ryan and I. Easter Eve, Ella was with us, so we made plans to have dinner with her Grandparents. I even dressed her in her Easter dress so they could get pictures. Once we were home, I boiled the eggs in preparation for the next morning, we made her basket, and Ryan filled up eggs with money and candy. The next day Ella woke up to her Easter baskets from us and my family as well, as a mini Easter egg hunt the bunny left behind. We knew we only had a few hours with her before we had to take her to her mom’s house, so we made the most of it. 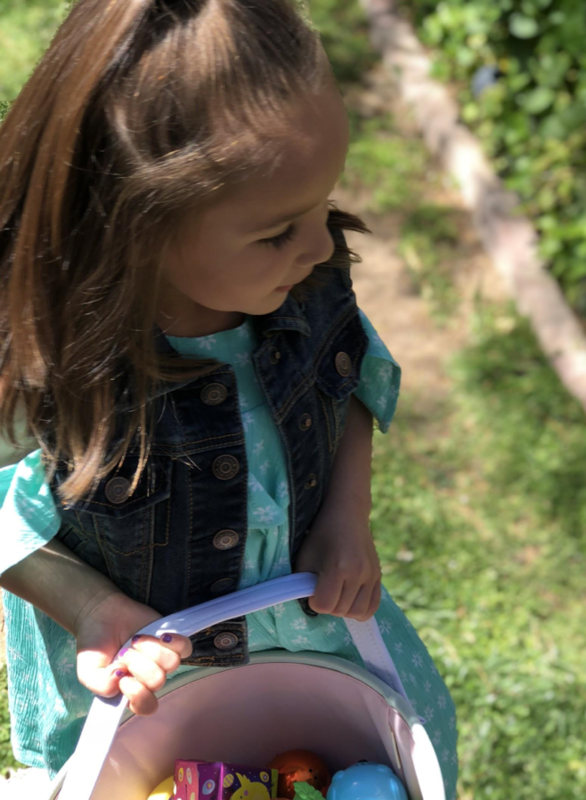 First was the egg hunt — she was so excited to see the bunny had filled her eggs with money! I wanted to go on the hunt myself. Haha! Next, we jumped into my favorite Easter tradition of dying eggs. I loved showing her all the colors you can make and decorating them with emoji stickers. She later told me dying eggs was her favorite part of our mini-Easter together, too. The rest of the afternoon was quiet for us after church since we didn’t have Ella with us. But lucky for us, the following weekend Ryan’s family was flying in, and they had planned a belated Easter celebration. Once again Ella was in her Easter dress and on the hunt for eggs! We had such a great time enjoying brunch with the family and watching her with her cousin. I told Ryan “it really feels like Easter”… just like that we started a new tradition, our own tradition!